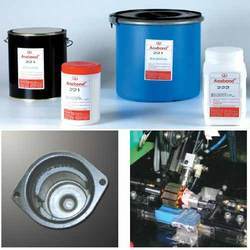 Anabond manufactures single and two-component high performance epoxy compounds. This adhesive system is specially formulated using bis – EPI type epoxy resin filled with inorganic fillers. In two part system, the resin and hardener are mixed, it cures to produce a completely cross linked net work, which has excellent resistance to Water, Oils, Industrial Solvents. 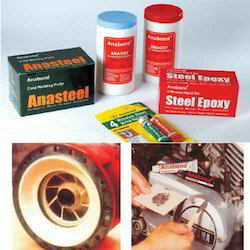 The single component grades are heat curing epoxy adhesive system. This adhesive system is formulated using bis EPI Type Epoxy Resin, a latent hardener & inorganic fillers. This system upon curing provides a tough three-dimensional network, which is resistant towards industrial oils and solvents. Being an elevated temperature curing system, it also retains adhesive bonding strength reasonably well at elevated temperatures. The cured system is toughened in nature and hence it can withstand impact loads and thermal shocks. This adhesive gets cured without liberating any by-products and hence the shrinkage is negligible. Single component epoxy systems are heat-curing adhesives, which exhibits exceptional bond strength on curing. single component epoxies are preferred where you need a high strength permanent bonds. Two part epoxies are room temperature curing adhesive, in which the resin & hardener is mixed in proper proportions to form a tough & rigid bond. They are used for a variety of engineering application such as filling cavities, repair worn out parts, arrest leakages etc.